Saturday, February 25, ended what turned out to be a record setting season for the Lady Red Hawks Competitive Cheer team. This season they captured the OK White Conference Championship for the first time in school history, and they received a total score of 761.28 at the Wyoming Invitational, setting a new high score record. The day before Regionals, an injury at practice called for a substitution to step in for a teammate in round 3. Zoe Castor, who was previously not in the round, had to step in and learn the round in one practice to perform at Regionals the next day. 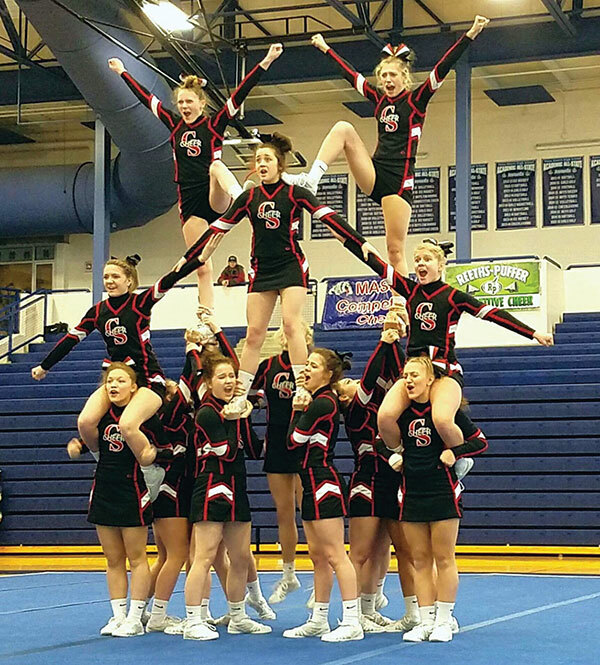 Cedar Springs Varsity traveled to Mona Shores on Saturday, February 25, to compete in the MHSAA Regional Finals. Twelve teams competed for a top four finish and a chance to move on to state finals. At the end of Round 1, Cedar Springs Varsity earned a score of 220.9. Round 2 gained them an additional 213.52, giving them a subtotal score of 434.42 and placing them in 4th place with less than a point behind 3rd place. Round 3 gained an additional 299.8 and a total score of 734.22 and a Sixth place finish, less than 9 points away from 4th place and qualifying for state. Those teams will go on to state. Cedar Springs finished behind Dewitt, who finished 5th, with a score of 735.54. Congratulations to our Lady Red Hawks on an amazing season.